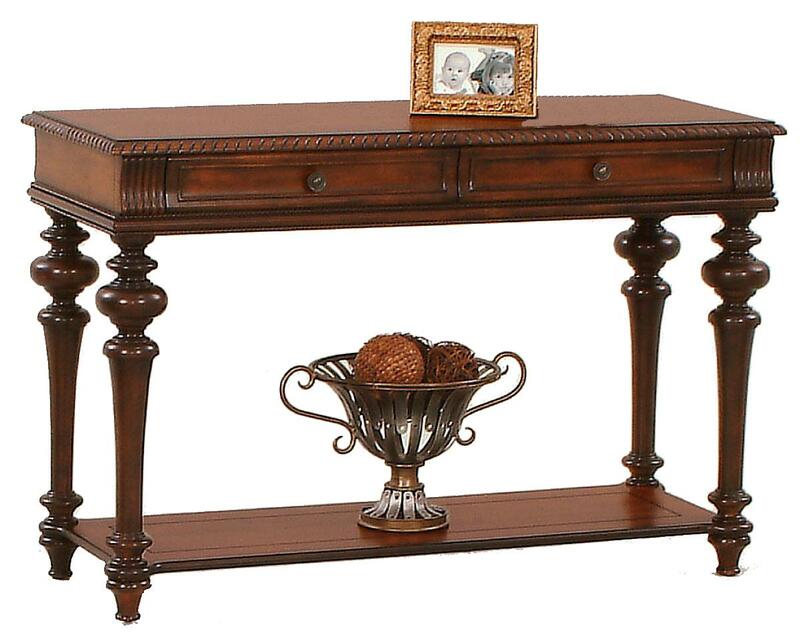 The Mountain Manor sofa table is a handsome piece warmly finished in Heritage Cherry. 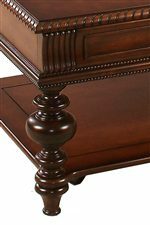 Standing on classic turned legs and boasting beautiful moulding details, this sofa table will make a wonderful addition in any traditional living room. Two drawers adorned with accent metal hardware are fantastic storage spaces, and the base shelf of the sofa table provides ample room to display your favorite living room accessories. Whether placed against the back of a sofa or up against a wall, this occasional table from the Mountain Manor collection will make a brilliant addition in your home. The Mountain Manor Traditional Sofa Table with Two Drawers by Progressive Furniture at Lindy's Furniture Company in the Hickory, Connelly Springs, Morganton, Lenoir area. Product availability may vary. Contact us for the most current availability on this product. Wood & Finish This collection is finished in a rich Heritage Cherry. Handles & Hardware Handsome accent hardware is seen throughout the Mountain Manor collection. 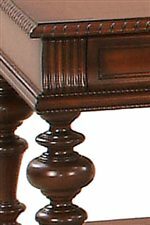 Case Detail Traditional turned legs support each piece in this occasional table collection. The Mountain Manor collection is a great option if you are looking for Traditional furniture in the Hickory, Connelly Springs, Morganton, Lenoir area.